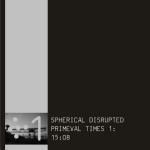 15 years ago the first recordings of Spherical Disrupted have been released on tape. Now, that the tapes and CD-Rs of that time are long sold out, the netrelease series "Primeval Times" starts to bring those old tracks back to you. All tracks have been remastered slightly and compiled in new sets. Some previously unreleased tracks, mixes and tracks from compliation have been added. Each part of "Primeval Times" will be released 1/4 year after the previous one. First part of the series is "Primeval Times 1: 15:08". Just as "Der eigene Weg", the track "15:08" was previously released on the "Zerschellt, zersplittert" tape. The "Relapse" version, which opens this release just differs from the original version with a shorter and modifed opening passage. The three "20:63" remixes present the track from a different angle, they have been released on the remix album "Kontingent" and at the "d.s.s.g. - Der Sampler" compilation. "comm36variation1" has also been released on "Kontingent". The track is based on a loop which was provided by the project Stimulus Response for sound treatment by different artists. The project does not exist anymore, but some members are still active, i.e. The_Empath. The previously unreleased track "Versteckt, versteinert" was recorded in 2004 for a compilation which sadly has never been released.